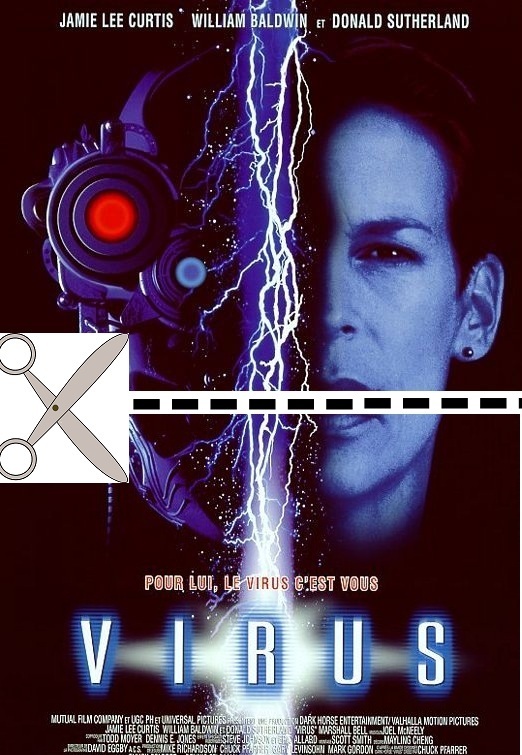 Here is my 5 minute interpretation of John Bruno’s Virus, a sci-fi thriller from 1999 starring Jamie Lee Curtis, Donald Sutherland, and William Baldwin. As a movie, about a mysterious electrical life-force that animates killer robots on an abandoned Russian research vessel in the South Pacific, Virus is somehow simultaneously frantic and low energy. It’s the slowest moving 90 minute haunted house movie on record. Bruno was obviously hired because he helped design the visual effects on Terminator 2 (and a number of other James Cameron projects), but he appears to know very little about adapting his expertise towards putting together an entire movie. Virus is heavily fragmented; it’s either a glacially paced tour of an abandoned Russian ship* (complete with the silly moment where Curtis happens to have a book about the Russian ship on board their own rusty, dilapidated ship**) or a jittery mix of CGI cloud formations, tsunamis, and silly looking miniatures being blown up. The conclusion is so rushed it almost functions as parody; Curtis fights a robot, gets knocked unconscious, wakes up, and then finds an escape route, all before a bomb with a 15 minute timer goes off. The fact that it feels like there are still quite a few scenes missing from this section means that the editors finally, somewhat, came to their senses about how time works. Other than the fractured ending, the biggest impression the movie leaves is that William “Kangaroo Head” Baldwin makes lots of unintentionally goofy faces. The other actors are stranded; Donald Sutherland is very hammy as the occasionally Irish captain of the ship and Jamie Lee Curtis takes the movie very seriously as the token female on the ship. Bruno repeatedly frames Curtis in the exact same shot over and over, with the camera rushing towards her as she stares off wide-eyed into the abyss. The only time she has something else to do is when the movie starts ripping off Alien 3, with its woman/Alien stare-down and the way Curtis falls when she loses her grip on a ladder. Marshall Bell plays the ship’s cowardly alcoholic driver and though he seemed very enthusiastic about his part*** when he talked about it with Bruno on the audio commentary produced for the DVD, all Bell really does is gulp from his flask and bug out his eyes. 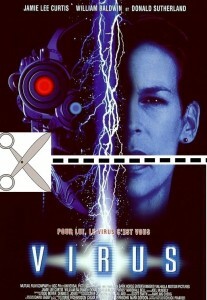 When it was released, Virus (which belies its $75 million price tag by most visually resembling an under-lit episode of Gilligan’s Island) was hurt by the fact that Deep Rising had just come out, also a film about miscreants taking over an abandoned ship only to be forced to fight off ungainly monsters. Both films suffered massive release date delays as the only major difference between them is the sense of humor that writer/director Stephen Sommers (The Mummy) attempted to bring to Deep Rising. Virus is generally funnier than Deep Rising, but not for the right reasons (it looks like one of the characters is strangled to death by some tubing left over from Brazil) and it’s often so underwritten that it’s clear that Bruno concentrated on what he was familiar with (robots), and ignored what he wasn’t familiar with (people). As for my edit of the film, one amusing thing is that there almost wasn’t enough plot to fill out a 5 minute montage, and so I explored the endless repetition of scenes and shots more than worrying about hammering home the story points. The soundtrack features tracks from Michael Nyman’s score for The Claim and Henry Mancini’s theme from a certain 1970s TV show. If you would like to watch the 5 minute feature, volume 1 on Trespass or volume 2 on This World, Then the Fireworks, you can find them here and here, respectively. * Bruno may have worked on the special effects for Titanic, but my use of the world glacially is just an unfortunate coincidence, not a heinous pun. ** All the exposition you need in one handy book! *** He even has basically the same part in Starship Troopers, playing a cowardly military man hiding in a closet, clearly the best way to avoid detection by enormous CGI bugs. Watch the 5 minute piece below or if you want to download it click here. One thing though; if you are going to watch it fullscreen, I recommend downloading the file and doing it yourself, because the player on the site distorts the aspect ratio in fullscreen and the plug-in’s designers have yet to come up with a solution. 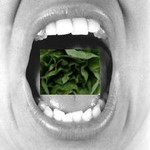 This entry was posted on Wednesday, April 25th, 2012 at 2:36 am	and is filed under Sci-Fi, Thriller. You can follow any responses to this entry through the RSS 2.0 feed. You can leave a response, or trackback from your own site.